Responding to comments in a recent San Francisco Magazine article AASCEND’s Board of Directors sent the following letter to the magazine, followed here by an accompanying press release. UPDATE: Read San Francisco Chronicle writer Laura Shumaker’s blog about the AASCEND protest here. Normally, we would not respond to statements made by individuals without expertise in the field. However, this article has achieved considerable attention, given the role of the tech community in San Francisco. Further, we note since the article’s publication you have made other corrections to it on your website. Ms. MacTavish Best is entitled to her opinion. However, readers should be told that her opinion has no medical or psychological foundation. 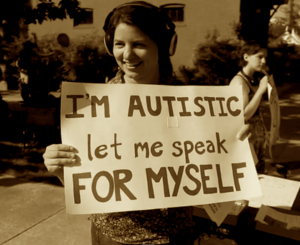 People on the autism spectrum are not defined by a selfishness or self-absorption. People on the spectrum differ widely in skills and characteristics—as widely as the general population. Some people on the spectrum do have difficulties in communication that may lead others to think them remote. But such difficulties are usually neurologically-based, and do not deserve the criticism of Ms. Best or others. AASCEND was formed in part to combat misconceptions about people with autism and other neuro-diverse conditions. We would request you make note on the Magazine website carrying the article that Ms. Best’s claims are challenged by members of the autism community. You can best reach us through our co-chairs … or through our website, info@aascend.org. The board members of the Bay Area’s Autism Asperger Syndrome Coalition for Education, Networking and Development (AASCEND), today issued a letter to San Francisco Magazine, challenging comments made in the Magazine describing persons with autism as “self-absorbed” and “selfish”. AASCEND board members called on the Magazine not to allow this comment to go unchallenged. The board requested the Magazine to indicate on its website and further dissemination of the article that members of the autism community challenge this linking of self-absorption and self-centeredness with autism. AASCEND was formed in part to combat misconceptions about people with autism and other neuro-diverse conditions.